Press Release – La Vía Campesina. 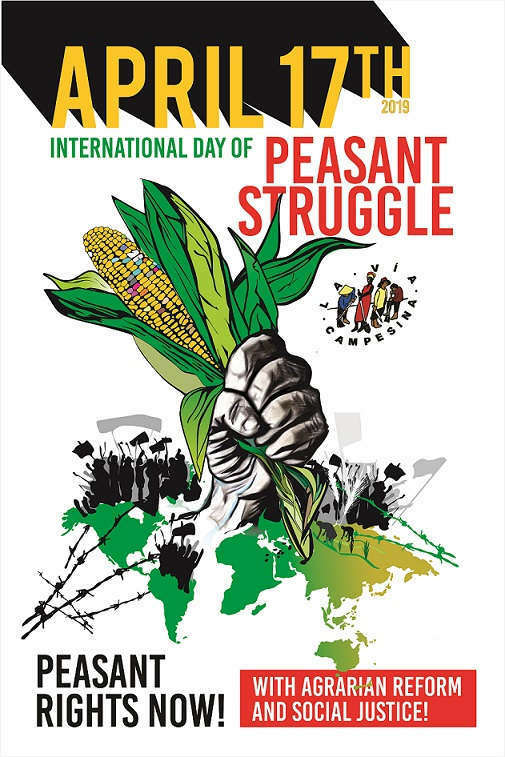 (Harare, April 17th, 2019) Today, April 17th, 2019, the International Day of Peasants’ Struggle, the member organisations of La Via Campesina are reaffirming the Declaration on Peasants’ Rights as a political tool to strengthen the global struggle for decent living and working conditions in rural areas. The Declaration should also be a tool for the worldwide promotion of urgently-needed agrarian reform programmes, as essential components of public policies that countries should implement in their respective territories. On this International Day of Peasants’ Struggle, we are also demanding full respect for our rights. The defence of land and territory is not a crime. There must be an end to impunity and an end to criminalisation, eviction, and killing. Today, when we remember the “Eldorado dos Carajás Massacre”, which took place 23 years ago in Brazil, and when we remember our other struggles in other places, we are calling for Peasants’ Rights with Agrarian Reform and Social Justice. As an international peasant movement, we are asking for agrarian reform programmes within a process of developing food sovereignty. We are asking for the strengthening of peasant family farming, which guarantees the right of rural and urban workers to healthy food at fair prices and makes possible the effective implementation of the Peasants’ Rights Declaration all over the world. Our proposal for agrarian reform not only ensures the democratisation of access to land, but it also includes all of the factors that allow peasants – women and men – to live with dignity: education, health, culture, infrastructure, as well as public goods such as water, the seas, mangrove swamps and inland waters, seeds, and biodiversity as a whole. It implies market regulation and an end to land grabbing, evictions, and killings. It also includes the strengthening of agroecological production as a way of farming that is consistent with natural cycles and that can slow down climate change, maintain biodiversity, and reduce pollution. With the worldwide onslaught of capital, especially in Latin America, “one of the principal challenges is the combined struggle for land, for food that is free from poisons, and for social justice. This means that, in order to guarantee respect for Peasants’ Rights in our territories, we need to build unity around a popular counter-offensive for regaining ground in our continent and for demanding public policies that are beneficial to us”, states Diego Montón of the National Peasant Indigenous Movement (Movimiento Nacional Campesino Indígena) of Argentina. In Asia, there are other problems and issues. Peasant women face many obstacles to ensuring that their rights are respected. In particular, women do not have the right to land, and they are unjustly treated both within social organisations and in their communities. In addition, peasants do not receive fair prices for their products, a situation that has given rise to many protests in southern and south-eastern Asia during the past year. The Asian region is also facing a series of regional and multilateral free trade agreements. The Regional Comprehensive Economic Partnership (RCEP) is one of the largest of these agreements; it covers 16 Asian-Pacific countries and poses a potential threat to Peasants’ Rights. Agrarian reform in the Middle East and North Africa is interlaced with occupation and colonialism; it is a key factor for attaining food sovereignty in a context of war. For peasants, agrarian reform is an imperative right; without that right, it is impossible to attain autonomy and independence, to overcome exploitation, servitude and erosion, or to confront the policies of direct and indirect colonisation enacted by the regimes in power. As member organisations of La Via Campesina, we are extremely worried to note that, in every corner of the planet – Africa, America, Europe, and Asia, we are confronted by capitalist interests that put the rush to extractivism before life itself. We are confronted by changes in soil use and by landgrabbbing on a massive and alarming scale that is in direct contradiction with popular agrarian reform. This situation not only threatens Peasants’ Rights, but it also jeopardizes Food Sovereignty the world over. This is why, on April 17th, we are joining together, in solidarity and struggle, to say: Peasants’ Rights Now! With Agrarian Reform and Social Justice! 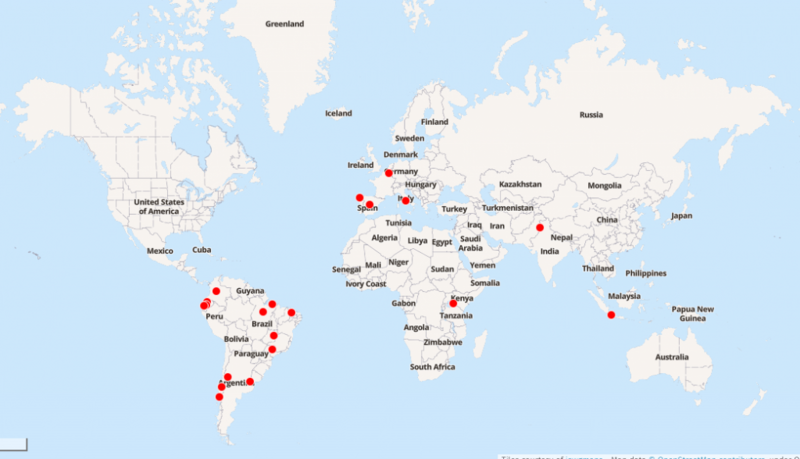 GLOBAL MAP OF ACTIONS THIS WEEK!